A subtropical outdoor garden Artscape with the Evandale Lake as a focal feature and a spiral-helix encased green bridge providing a dappled shade connection to Chevron Island. Opening of Cultural Centre was due ahead of the Gold Coast 2018 Commonwealth Games. Stage 1a of the new Gold Coast Cultural Precinct, (a 1.5 hectare, $37.5 million amphitheatre) opened in 2018, was the first step in delivering a new home for arts, culture and civic celebration in Australia’s 6th largest city. 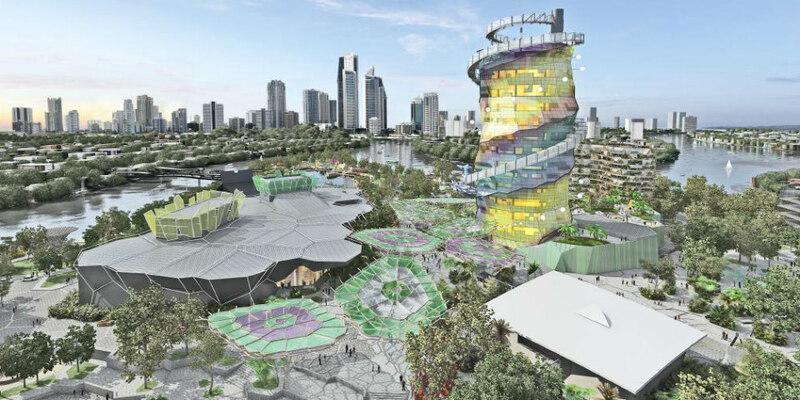 Stage 1b, to be completed by 2020, will include a new international-standard City Art Gallery, along with a Green Bridge connecting the precinct to neighbouring Chevron Island and Surfers Paradise. Future stages will include an expanded Living Arts Centre, containing a new 1200-seat theatre; versatile 350-seat black box theatre; refurbished existing performance theatre accommodating up to 600 people; and a central Great Terrace. RCP was engaged in 2014 to provide programming services for the master planning phase of the project. This required the development of a master programme inclusive of all stages of the project from design through to completion. Each major component of the project was programmed separately with procurement strategies differing based on scope, timing and complexity. Throughout the master planning phase RCP provided regular progress updates and written reports.